No matter how much some fans (and managers) might complain about refereeing, English football really has an enviable reputation for integrity. Around the world the Premier League is known and respected as one of the top, and one of the toughest, leagues. That made it a perfect target for scammers who wanted to subvert and fix results in a betting fix, since no one would have thought it really possible. It all revolved around a major difference in betting systems between Britain and Asia. In the UK, if a football match has to be abandoned before the final whistle for some reason, then all bets are literally off. In Asia, if the match is in the second half when it’s abandoned, then there’s a payoff on the result as it stands when abandoned. At its heart the scam was elegantly simple. Those behind it would simply arrange a floodlight failure in the second half of night games at the point when the score was where they wanted it (although, it must be said, they made no attempt to subvert players to influence the scores). It wasn’t done often enough to raise suspicion – there were just two completed instances – but with large enough bets in each instance, that wasn’t necessary; there could be some very serious money made on each match. It all originated in Malaysia, where betting on the Premier League has always been popular. There were two occurrences in 1997, the first when West Ham played Crystal Palace and the floodlights suddenly failed after the Hammers had equalised, and the second when Wimbledon played Arsenal and the lights failed after half time with the scores tied. No one suspected anything. After all, electrical problems did happen, and in the darkness fixing them quickly was almost impossible, so there was no option but to abandon the matches. Any scam requires the involvement of people, and the more people, the greater the risk. 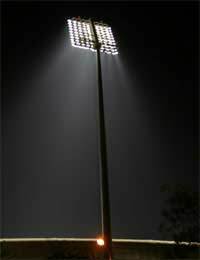 For the third floodlight scam, which was to happen at Charlton Athletic’s ground when they played Liverpool in February 1998, the trio involved – two Malaysians and a man from Hong Kong – needed inside help from Charlton Athletic security staff. They suborned one man with a £20,000 bribe – and the size of that is an indication of just how much money was involved in this scam, believed to be a staggering £30 million – but things fell apart when he tried to involve another security guard. The police were tipped off, and were waiting as the trio and the security guard arrived with equipment to sabotage the floodlights. Everything would have been in place, and then have been tripped remotely three days later during the game. Instead four men were taken into custody. However, at the point the police had no suspicion that there had been more than this single match involved. It was only when they searched the suspects’ hotel rooms and discovered the names of West Ham and Wimbledon employees that they realised this had been going on for a while, although they’d discovered enough equipment among the Malaysians’ possessions to disrupt another eight games. The arrest of the conspirators broke up a very carefully organised ring, one that had planned its actions subtly and carefully – and even then it was sheer luck that the police found out it involved more than one game. Although it affected Asian betting, it thankfully left no slur or question mark on English football, and precautions were put in place to ensure it couldn’t happen again.